We took our children to London and they loved it. Mind you, they had to love it because if they didn't there is a good chance we would disown them. But they loved it. They loved the Underground and the accents and the food. They loved the old buildings and the zoo and the chocolate. The trip was just as successful as we hoped it would be. What fascinated me was seeing London through their eyes. We have visited a number of times and there are some differences I just don't notice that much anymore but our kids, coming from small town America, picked up on a lot of things. Some were tiny little differences, some were just observations, some were things they were curious about. So, here are a few of the things my kids noticed about London. So many people smoke. You walk through the streets and there is a near-constant smell of cigarette smoke. My son noticed this particularly because he says that among his generation, smoking cigarettes is viewed as disgusting and he doesn't really know anyone who smokes. He was surprised by the number of younger people who were smoking. There is so much green space and people treat it like it is their own backyard. The kids were amazed at the huge parks right in the middle of the city and they were impressed with how busy they were. People were picnicking ( and boy, do the British know how to picnic--hampers and wine glasses and fancy finger foods) and playing ball and sunbathing and walking their dogs. Which leads me to the next point, the dogs. Both of the kids commented on how well-behaved the dogs are. We walk on the bike trails near our house and the dogs are always leashed but they still bark and want to jump on us. In the parks, the dogs were running free but they never once jumped on anyone or caused a problem. Maybe American dogs are just, in general, poorly trained. I am not really a dog person and I wanted some of the dogs I saw. My daughter wanted them all. The kids were amazed by the history. They know that the U.S. is a relatively recently created country and that a building here is considered very old if it was built a couple of hundred years ago. However, it is something else entirely to see for yourself the truly ancient buildings in England. 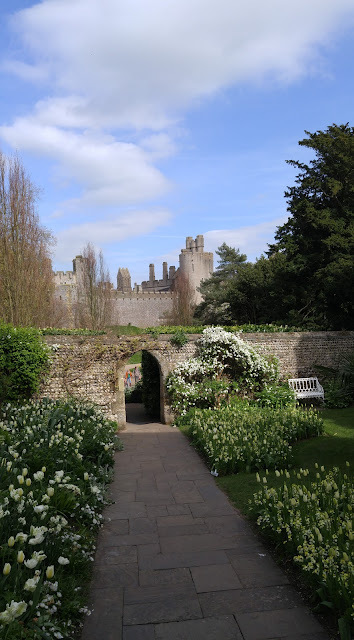 We toured Arundel Castle (above) which was built in the 11th century and they were enthralled. It was one of the highlights of the trip. My son said it might be the coolest thing he has ever done. That is high praise from a sixteen-year-old. They loved the food. 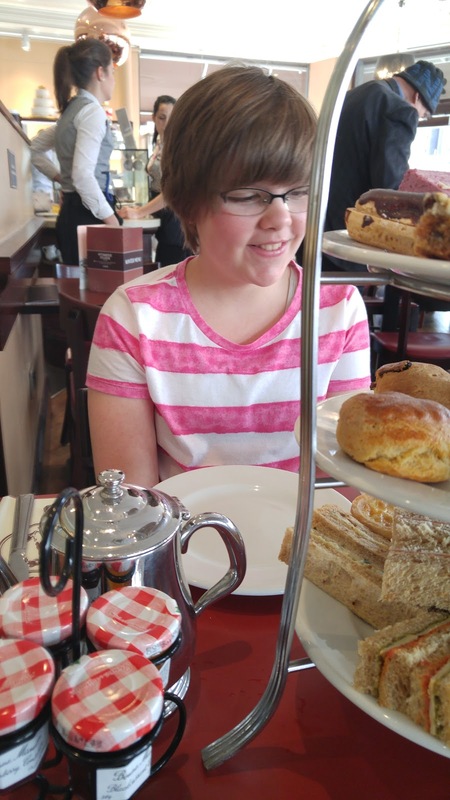 I took my daughter out for afternoon tea and she thought it was wonderful. She wanted to go every day. We didn't eat in fancy restaurants, we aren't fancy restaurant people, but they thought the food was typically better than what they get at restaurants at home. They also thought the food available at cafes and restaurants in the attractions we visited was far superior. They couldn't believe that the zoo didn't just have chicken nuggets, limp french fries, and dry hamburgers. It isn't that the food at the zoo was amazing, it was just that it was decent and zoo food here is basically disgusting. The restaurant at Arundel Castle flabbergasted them. There was hot food that tasted home cooked, things like sausage and bacon casserole, mackerel salad, and quiche. Plus, big slabs of cake and scones with cream and jam. Again, it isn't that it was the best food we ate, it is just that we are so used to food at museums being unpleasant. They did love Gourmet Burger Kitchen. I think we ate there three times. They had questions about so many things. Do London kids take the Underground to school and, if so, do they get a discount on their fare? We toured the castle and my son had questions about the Civil War. My daughter had questions about the money and why the terms she has read in old books aren't used anymore. She also wanted to know the names of all the flowers and some were not familiar to me. They just were interested in everything and we loved that. My daughter has decided she wants to move to London. Both of them spent a lot of time discussing what they would do on another trip. They debated the merits of staying in London again or staying in the countryside and they decided that next time we need to rent an apartment or cottage instead of staying in a hotel. It was wonderful to see them so enthusiastic even though we did have to break it to them that another trip is not going to happen anytime soon. They loved London. We loved watching them fall in love with London. I just wish we had a bit more time but then, isn't every vacation too short? I did manage to sneak in a bit of book shopping but that is a post for another day. *I realize my daughter is the only one featured in these photographs. That is because, in general, my son and my husband would rather not appear on my blog. And I am always behind the camera. I think there are four photos of me from the whole week. I love the London parks. It is like having the best of both worlds. You can be in the city but still escape into the parks when it all gets too chaotic. Well, I think my daughter wants to move to London just so she can take the tube to school. It sounds much more entertaining than the bus! It was so much fun to watch them and I was so glad that they were enthusiastic about everything. What a wonderful trip! I know that when I visited London in my early 20s, the sense of walking around all those books I've read over the years was really powerful. And the one big trip I did with my own parents--going to Bavaria and Austria when I was 11--has stayed with me for over 30 years. What a great family memory. My daughter is 11 now so I am hoping this is a memory she will always carry with her. I think one of the things I love about England is that it is so connected to books, or at least it is to me. You are right, it is like walking around in the books. The only observation that surprised me was that so many people were smoking as I don't know anyone who smokes, but maybe living in London is so stressful that they can't give up. I hope one day you and your family will visit Scotland, I'm sure you would love that too. I would love to visit Scotland and I was actually planning a trip there for this year. 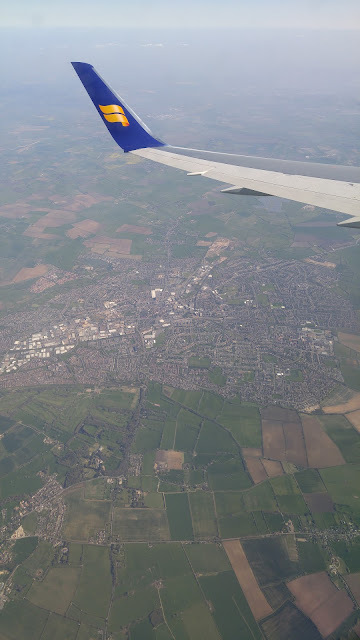 However, then we decided to make this a family trip instead of a couple trip and it made more sense to go to London since we had been before and knew our way around and that sounded easier with the kids. Scotland is a top contender for a thirtieth anniversary trip in a few years. Your blog always makes me desperately want to book a trip. I'm so glad you had a great time! Better a vacation that feels too short than one that feels too long. How wonderful you could all have this experience together! It was wonderful. We had so much fun. It just felt like it flew by but, as you said, that is better than it crawling at the speed of glacier ice. Both kids have been bitten by the travel bug now. My son wants to go to South Korea or Japan and my daughter changes her destination daily! Dreams are good though. So cool! I hope we can do something like this when our own kids are a bit older. My family traveled a lot within the US when I was a kid, but we seem to mostly just go visit my parents in NC or our relatives in the midwest, and I'd like to expand that now that they're getting better at riding in a car all day.